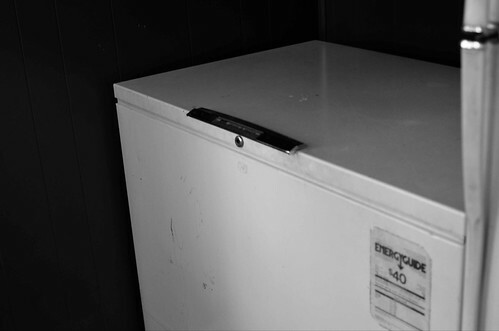 One of the most critical appliances in our home when I was growing up was our chest deep freezer. We kept it in the attached garage, just a few steps out of the garage door that opened onto the kitchen. That freezer would store bag after bag of frozen fish caught by my father, lots of venison and beef that my family would trade for (or, in the case of venison, occasionally hunt for as a food source), frozen vegetables, and countless other food items. It was pretty much a daily routine to retrieve something out of the freezer in the morning to thaw for the evening’s dinner. Whether it was fish, vegetables, or meat, our meals were often acquired when they were cheap and thawed when we needed them. My wife, Sarah, had a very similar experience growing up. Their deep freezer resided in their basement and contained the key ingredients of most of their meals. In both cases, our families were not rich. They had to find creative ways to stretch a dollar. Given that food is a big part of any family’s budget, stockpiling food is definitely a strategy worth investigating. A deep freezer makes it easy to stockpile freezable food (in other words, most food) and keep it from going bad. In other words, the presence of a large home freezer makes it possible to capitalize on discounts on perishable foods. It was unsurprising, then, that one of our first purchases when we owned a home of our own was our deep freezer, which, like the freezer at my parents’ house, resides right out in our attached garaged, near the garage door. It’s always got some food in it, and at times it has quite a lot of food in it. It all depends on the opportunity – and when opportunity strikes, we’re able to hit it hard. I’ll give you an example of this. Recently, a local grocery store had a sale on bags of flash-frozen vegetables. I don’t remember the exact price, but it was very low, something on the order of $0.79 per bag or something, limited to ten per customer. Given that a bag of flash-frozen vegetables is often a key side dish for our family’s dinner as well as our lunches the following day, that’s an attractive sale for us. If our only freezing capacity was the freezer atop our refrigerator, we would have had to stop at four or five bags. Simple space issues would have kept us from capitalizing. Instead, Sarah went to the store and bought the maximun number of bags, then I went to that same store and bought the maximum number of bags. Another example: a friend of ours offered to sell us a quarter of a cow, processed and packaged, at cost a few years ago. This meant that our cost per pound for the meat was about 40% or so of what we would have to pay for it in the store, but we would be receiving a lot of it. On the order of 150 pounds of meat. Thankfully, we had our deep freezer, so we were able to make it all fit. We were able to knock 60% or so off of approximately 150 pounds of beef. Not only did we enjoy it ourselves, we also traded packages with friends, family, and neighbors. I can go on and on with these examples: fresh food from our garden (or from the gardens of friends), quadruple batches of casserole, frozen breakfast burritos, frozen vegetable stock – it’s an endless list. In each case, we’re taking advantage of the economy of scale by producing a lot of something (reducing the cost per item) and then saving the rest for later. The only drawback of this plan is the cost of a deep freezer. You can get one for $300-500 or so, and the annual energy cost varies, but is usually somewhere around $50 a year. To break even, you’re going to need to be saving about $60-70 a year on your food costs. For our family, we can sometimes save that much in a month due to our deep freezer. Between the flash-frozen vegetables bought at a discount, the frozen casseroles prepared ahead of time, the breakfast burritos made at an incredibly cheap rate per burrito, the produce from our garden socked away for later, and countless other little things, the deep freezer saves us money almost every single day. It’s a key element of our family’s food frugality.